“He’s completely transformed.” Funny commercial. It was twenty years ago I first volunteered and worked the Orange county polls. Today is the Florida presidential preference poll. Its a simple primary, but some other local races have piggy backed onto the ballot. 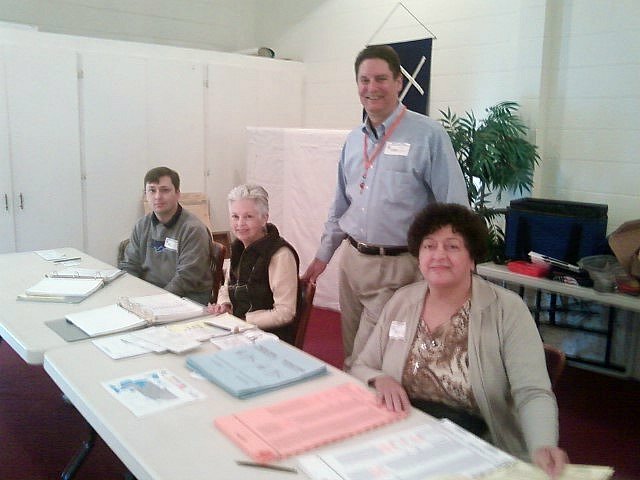 Here I am with a couple of my poll workers this morning..
Its a long day, and the turnout has been suprisingly steady. We encourage absentee and early voting, but still we’ve had good traffic this morning so far. We may need further dialog to advance any considerations. ps. this is one of the rare occasions when I will use “actually” in a sentence. Its atrociously overused, IMHO. pps. Also, in the illustration, a rare instance when the Comic Sans MS font is appropriate, again, mercilessly overused. William and Ellen Gordon (lower left) and their children. W&E are my great great grandparents. Frank, (2nd from left back row) is Mom’s grandfather, and my great grandfather. William fought in the civil war at age 17. He moved his family from Wisconsin to South Dakota in 1885. This comes from a collection and book compiled by descendant Eric J. Guignard of Chino Hills, CA. 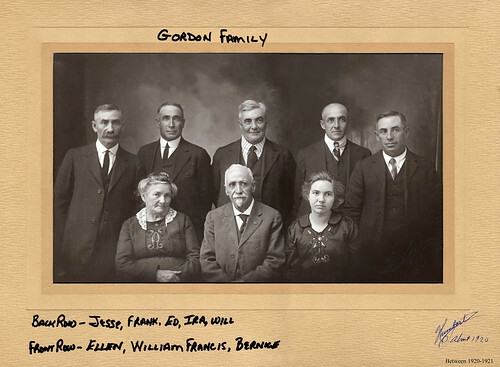 It traces the Gordon lineage back to Scotland. I knew him well until they moved to Oregon during WW II. … I never saw him, though, dressed any way other than a three-piece suit with watch fob, garters on her shirt sleeves, and spats on his shoes, even though he was long retired at that time. And non-air-conditioned summers in S Dak could be brutal. Ted Issen’s band (16 y.o. Ted plays bass) had a gig at Austins Coffee in Winter Park last night. Makeshift played this same venue a couple of years ago. Linda and I dropped in to pick up Gina and Nick and the place was mobbed like I’ve never seen. It looked like half of WPHS turned out. There were a few parents hovering in the back. I grabbed this one photo on Linda’s cellphone through the picture window out front. Gabe on keyboards is the leader and songwriter of the trio. Ted anchors a solid rhythm section with drummer Kevin. Eric’s Children is the name of the group and you can visit their myspace site here and listen to a couple of their songs. Yes, we agreed to host another Japanese student. Nagoya College student Ayumi I. will arrive with 18 cohorts on Feb17, and stay four weeks through March 16. This is the same UCF program we participated in two years ago. Our friends quipped that we are slow learners. I like Linda’s take better; that we are due for some good student karma.